Does this sound like you? If so, maybe you’ll find something here that interests you. Because I have four precious children all under the age of five, this is pretty much where I live every day. I enjoy staying at home with them and thinking about whatever comes up. Of course it helps that each child is so different from one another—I am pretty sure each of the four Greek personalities is represented in my brood =) Isn’t it funny how you can go from being an autonomous, outreaching, spontaneous single female at one moment to a rather cloistered mother at the next who over-intellectualizes about the pros and cons of switching your toddler to a big boy bed? Well, it happens! This blog is meant to share things I’ve pondered and researched over the last five years… things that have come up in my own home, questions I’ve asked, questions I’ve received, and things I am still searching out answers for. It also chronicles my battles with auditory processing disorder in one of my sons, and sensory processing disorder in another. As a psychologist and recent education graduate, I pretty much obsess about child development and how children learn. I also care deeply about the moral dimension of their hearts. If I had to state my desire in one sentence, it would be for moms to find their own conscience about what practically works for their own family—to relieve moms of pressure and guilt from the outside world of experts, and to see where the rubber meets the road in terms of childraising theory, practice, and everyone’s ultimate best interests. It is my hope that something here will help answer a question of yours, whether it is about baby training, special needs, preschool lessons, or behavior problems. Perhaps something our family has been through will save you some time, worry, or just provide the much-needed empathy for how difficult raising small ones can be! Please feel free to comment or ask questions wherever you’d like. I thrive off of people’s feedback and would love to hear what you think. 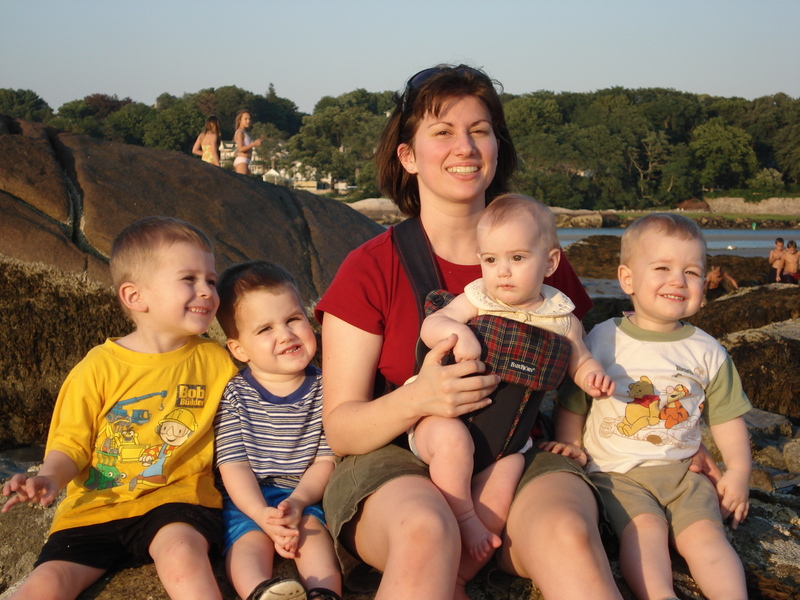 I have four boys–and at one point they were ages 5 and under, too! Enjoy this period of your life. I know you’ve heard it before–but it goes by so quickly. Well that’s my son all right! !At least it sounds like him! He turned 5 in nov. VERY BRIGHT indeed! He knows all the alphabet,count to 100 ,colors,shapes months,days of the week,digital time working on standard and can read small books and loves computer games and also can write his name it’s endless the things he can do. But his conversation he and she is mixed up sometimes me,I you and recalling something that happen in detail it’s broken in to bits or can’t recall vividly. I work with him at home alot academic because that is his strength. also I work on his ability to recall things by using pictures or asking him different simple questions about the matter or even drawing. He also has a IEP and receives speech but is not classified and attends a public school. I requested a 1:1 aide from the city school district untill I get a definite diagnosis from a ped specialist in about 3/12 wks cause his DR. is not certain. He has had the 1:1 about 30 days and it’s great before it was the student teacher but when she left it went downhill!!! If you told him to do something in a small group or1:1 he could do it larger groups forget about it. He starts getting confused and frustrated. But all is well with the 1:1. Build on his strengths it will help him lots with school,conversation etc. Sometimes if he can’t find a word offer him some alternatives. SEND him to school social interaction is very important it will give him ways to communicate with his peers he will recall things that happened at school in his own words!! Also LISTEN he will recall things at anytime and will want to talk LISTEN GOODLUCK!! You have a wonderful site, very helful as i just have a baby girl. Will come here daily. Hallo, I just started looking on the internet for some direction into the concerns I have about my little boy of almost 4. He is a very active, bright little boy, but no language skills. He pronounced his words wrongly, although by now we understand what he says, but strangers thinks he talks a strange language! Please can you help me with information on the auditory processing disorder and IEP that are mentioned in the letters above, for I do not have any knowledge about this. Hey, I really like your blog.. I have mentioned your blog in mine. Hope you don’t mind. Hello! I am Ashley and i have 2 kids- Sabrina,4, and Drew, 2. My husband, Dave, and I have been married 10 years. I love my family, and we are trying to raise the kids in a Christian manner. Sabrina has, most likely, Asperger’s syndrome, and it is a challenge to deal with. Would any readers mind emailing me with suggestions about living a “normal” life? I would love to hear from people! Just curious. Are your blog stats daily, monthly, or yearly. Do you update them yourself? I have a website and I would like to include stats. I need some advice. Great blog! I have 3 kids ages 4, 7 & 10. Hello, I have had my 3 all 20 months apart. 4.5, 2.75, 1 years. I love them dearly and love spending time at home with them (currently a full time mum) but at the moment am struggling to get all the house work done and stay sane. I feel like I could work ALL the time, not play with them and STILL not be on top of things. We have fairly organised ‘zones’ eg craft table, toy cupboard etc, but at the moment as I look around, the house is really messy around these ‘zones’.On top of this, baskets of unsorted clean washing. Any tips about this sort of thing??? Thank you so much for sharing your views. I’m a young mother of 3 and a childcare student in Australia. I have only read a few posts so far but I found them to be a wonderful breath of freash air after reading my text books. I look forward to comming back when I’m not sleep deprived & reading some more. I have two kids a boy and girl, ages 2 & 1…11 months difference. thanks to your blog and will read more of your posting!! Hi – I REALLY like this blog! !1 Thank you. I have a 4, 3 and 1.5 year old and am just sick of the gushy SAHM balony out there and I LOVE hearing advice and thoughts from a PROFESSIONAL intellgent mom who is in the same boat with very closely spaced kids. It is so lonely going from being a professional to being at home with 3 little ones with no one to relate to because I don’t scrapbook, sew matching outfits or can’t/won’t go to gymboree or all this stuff you just “HAVE” to do nowadays. I especially love the “he’s a boy, not autistic” blog – I have been wondering / looking for info like this for over a year after I pulled my son out of his pointless “speech” classes last year knowing nothing was wrong with him and angry he was already being labeled with some “delay”. He looks, acts and talks like EVERY other boy his age I see EVERYWHERE! I’m all for screening kids for REAL problems (and God Bless the parents of children with autism – I honestly don’t know how you do it.) but, really?…. EVERY kid has to follow the exact same growth charts these days or some doc will label and send them off to specialists… anyway – yea – he’s 3 now and sounds just like your blog – a REGULAR boy. I like the activities for 3 year olds stuff – i think i’ll print them off. Sorry for the babbling – i was just so excited to find someone with information and advice who is fighting off the rampant dumbing-down of parents propaganda. Thank you! I just stumbled across your blog after I googled Single income budget, and there you were! I have to say, I am HOOKED!! I have a 2 1/2 year old son and a soon to be 4 month old son, and I am now staying at home with them! So far everything I’ve read on your posts are to the point, sensible and refreshing, especially when you use your own personal experiences!! Thank you for doing this and I look forward to scouring your blog on all things kid related!! Your blog and comments about autism, echolalia.. and just being a boy are the most helpful that I have read anywhere and I have spoken to many a speech pathologist and belong to many groups. You explain everything so simply. As the mother of boy girl twins, with a girl who speaks non stop and a boy who is slowly, slowly catching up… I have always worried about my son. Reading your blog I feel like he is just fine. I really enjoyed how you commented on the different ways you have interacted with your daughter, versus your sons! It really hit a chord with me. My son is doing great, but your blog has so many great ideas! Like about how to teach colors. THANK YOU FOR MAKING ME FEEL SO MUCH BETTER! KEEP UP THE GREAT WORK. I’m so delighted to have found your blog. I’ve read only a few posts, but appreciate your views and articulate writing. I look forward to reading more about your views! Great blog. I have a blog of my own at http://www.notjustanotherdad.com on similar topics and found yours as a referral blog to mine on toe-walking. I am the father of two children. My son is almost 3 and my daughter is 8 mos. You’ve got some great posts and fabulous traffic here…I hope to get to where you are. You must have great help from husband or otherwise to find the time to write this with your “brood”. Keep it up! I’m so glad I stumbled on this site. Brava! I came upon your site while searching for information on echolalia. I wish your pearls of wisdom had been available when I had our children forty plus years ago. We had a two year old daughter when our our fraternal twin sons were born, and then we moved to a village in Alaska. (My main resource was a book by Dr. Spock.) Now we are blessed with five grandchildren — ages ranging from eighteen years to six months. Our two and half year old grandson has exhibited echolalia for some time now. He is a bright child, understands concepts that surprise me and is loving in nature. Is also bilingual for Spanish, but since I don’t speak it, I don’t know if the echolalia is present in both languages (and hadn’t thought to wonder about it until now). People find his echolalia amusing, but lately I have felt concerned. Most references immediately give you the impression there is something wrong, and I couldn’t find anything regarding it being normal in speech development. Then I came across your site and found your article to be the most enlightening. I think it tells me not to jump to conclusions and to wait a little longer. He does answer “no” and says “my……”, and offers self-initiated conversation aside from the repeating of what is said to him. Thank you for your reassuring words with ways to measure when there should be concern, and overall for your fantastic website. Hi, and thanks for your website. I’m not sure what I wish to add to it except to say that in the past few months I have very much appreciated your attempts to bring a little balance back to the ample supply of ‘fear’ that is available to parents of young children. I notice you haven’t added to it for a while. I hope it’s just the business of kids, all’s well, and we’ll hear from you again soon. Like a lot of people, I first found your site through googling ‘echolalia’. We have a just-over 3 boy (1st born) who has receptive and pragmatic speech delays (ie: lots of vocab, very limited conversation). He has a few other quirks – none of them I would describe as dominating – and yet googling any of them sends you hell bent down the ASD route, where there are many many scary things to read, and against which many of your posts (and the other parents who chime in) are a welcome relief. In terms of our own journey – I have been wedged between my belief that we are already raising a generation of over-observed, over-analysed kids vs the strong messages about the importance of early intervention I am hit with constantly. So, on his 3rd birthday we wrote down our concerns (mainly speech and socialisation) and kindy’s and took them to our local GP. She agreed the speech delay needed looking into but did NOT feel an ASD analysis was required. It was the speech therapist who would subsequently come to drop “autism” casually into conversation, which would lead to a full development check being called for, which we will attend later this week. This has unfolded over 3 months. In that time his language, listening, direction-following and interaction have all come ahead strongly. His behaviour has improved. His frustration is less. His relationship with his younger brother is becoming quite beautiful to see. Is he less interactive than other kids his age? Yes. Is he somewhat obsessed with letters and numbers? Oh yes. Does he line up toys? I think we could count the occasions on one hand. Does he walk on his toes? Rarely, and usually then when he’s very excited about something. But is he affectionate? Oh yes, he’ll spot his grandmother across a playground, shout her name and run to give her a hug. Is he funny? Oh yes, his carers in particular love his mischievous and quirky humour. Can he handle change? Sure. I would say as much as any 3 year old. He’s never freaked out in a shopping centre, demanded we must drive the same route – and if his favourite breakfast isn’t there, well, he might get a bit upset but after a minute he moves on. But his fine motor is behind a bit (things like drawing and craft) and he does have trouble concentrating – so I’ve no doubt he’ll fail many of the tests he’ll take this week. Classic tests like building a house of a certain number of blocks. We know he can, we’ve seen him do it many times. But will he choose to do it at the time a stranger says to just because they say so?….I doubt it. And what…. in a 3 YO….does that REALLY mean? “The speech is affecting him, so we should help him with it. As for the other things…. Look; there may be some things here that we could speculate are ‘a little aspi’ or ‘a little auti’, but there is nothing serious. My view is that if there is anything along that line it is only on the very cloudy edge of the spectrum, where hundreds of people that you and I know are living happy, healthy and productive lives. I have to stress to you that this comes down to an almost philosophical view about how much we pathologize and medicalize children. Many GPs would recommend a spectrum check and if you are concerned about that I will write you a referral immediately. What are lining up toys and walking on toes suppose to indicate? I’m sure you’ve already googled this up since, but lining up toys and walking on toes are promoted as “red flags” for autistic behaviour. What is less promoted, and I am quoting Prof Simon Baron Cohen – one of the absolute gurus of evidence based (as opposed to theory based) austism research – is that “ALL children show some autistic behaviours”. That’s right. All. Some will line up toys. Some will walk on toes. Some will flap their hands. Some will parrot speach. And these things, in and of themselves, mean nothing at all. As the Prof puts it: “the issue is how many behaviours are evident and to what extent that are pervasive in a child’s life”. This is something that all the various “autism screams” websites fail to promote, and in the process are causing millions of parents unneccessary angst and clogging up our pediatric units. If your kid lines up toys for a period of time (ours did for about a week and then got bored with it) then it means nothing. Of course, if a child shows MANY different symptoms, or more to the point, shows symptoms in such a pervasive way that it is really interfering in their live, happiness and development, then that’s a different story. Thank you for your blog, I have found it very helpful. I became concerned when someone commented on my son’s behaviour (acting silly and not making eye contact with adults). I now believe it is just his character. Thanks again. love the blog but wondering why you write so intelligently but then have such young kids diagnosed. It has been several months since I wrote about our grandson and echolalia (September 10, 2010). Now he is three years old. He converses readily and is at the age of “I can do it all by myself!” The echolalia has subsided considerably, but pops up when he is stressed. I did ask the babysitter whether the echolalia was present when he was with her –where they speak only in Spanish — and she said, “yes,” but it follows that he does it less there, too. In contrast his younger sister, who is fifteen months, hardly speaks at all, but understands exactly what is being said. Thank you. Your sharing experiences are life saver to me. I’ve been heart broken with the diagnos of pdd-nos about my 3.5 year old boy. Your articles comfort and re-assure me a lot about my son’s situation. I’ve made the decision that my son was mis-diagnos with the problem, just like my little sister had told me that I worry too much and stop labeling him as pdd-nos. I came accross your article on echolalia on toddlers…i’ve never written anything online so please forgive my lenghty comment. I have two boys, a 3.5 yr old and an 19 month old. My 3 year old has been through a lot. From speech therapy, occupational therapy, behavioral therapy, 2 autistic evaluations through UCLA, assessments through regional centers, school districts, psychologists etc… For a long time i’ve had strangers in n out of my house everyday showing me what to do and how to do it, what to say and how to interact. Every single day of the week my life was on hold trying to get help for my son who no one seems to know what’s going on. Bottom line he has high cognitive abilities and shows impulsive energetic behavior, he can be defiant and aggressive when you take his toys without asking. On the other hand he’s good at sharing and can play with a toy for a long time if he likes it. He has good vocabulary but from time to time he regresses echolalia type of repetition. He’ s great one on one but gets scattered in big groups. He’s loving, affectionate, and funny. All the results showed just to keep an eye on behavior. I was ready to celebrate. It had been a terrible pregnancy with misdiagnoses and more uncertainty with developmental stages to go through. I thought finally my nightmare was over and my son was going to be okay. I had fallen so deep in depression that was glad it was all going to be okay….and now here i go again, there’s something wrong in his development. Today at preschool, the director explained that my son had been showing impulsive behavior and high energy which are red flags and along with some other things like his repetitive speech and behavior might be signs of a bigger issue with his development. I asked them for guidance, help to point me in the right direction but was meet with getting more therapists. What they don’t know is that therapists charge $200 a session and insurance won’t cover it and i had to quit my job to help with my son. Can’t pay for anything privately and don’t even have 20$ on checking or savings account. My son stopped receiving help because he turned 3 and now he doesn’t qualify for help. So what can i do? I have a little one at home full time and another son with a need for services that i can’t provide. I feel like such a failure. Parents are suppose to be able to give your kids the tools to be successful in life but i can’t even provide him with the help for him to develop healthy. It feels like not being able to give your child food to nourish. I feel so guilty i wish i would’ve been more successful in life to be able to provide my child with the equal chances his peers will get. I think the most painful part is when i look at his little eyes and can’t explain why mommy didn’t make it better for him. Please if you have any ideas send them my way. Hi again. Found some more time to reply but I’ve re read your first comment again and realised that you were asking the site host for advice, not putting out a general call for comments. Sorry about that. Didn’t mean to interfere. Meanwhile, you have, like all of us, every parent, grandparent, teacher, baby sitter etc who is armed with a little knowledge about “red flags” and other things picked up from the web etc, saying: “hmmmm…..could be something here.” But as a parent of two boys (one with an official mild ASD label and one without) I can only encourage you to regard this stuff as an example of “a little knowledge is a dangerous thing”. Just take it all with a big pinch of salt. I think the fact that you feel as worried as you do is more a comment on the expectations we place on parents these days; and the totally unrealistic expectations we place on children to all develop exactly the same way at exactly the same time. Life just isn’t like that. It never has been. Maybe I’ve missed something and I don’t mean to diminish one iota how scary it is when people suggest that your kid is “different”. But if your child is forming good, warm relationships with you, then I would say that is the greatest sign that he will, in time, do the same with others. I hope this helps and if you want any more practical tips from someone who’s been through a very similar thing (our boys are now 5 and 3) then feel free to post. Otherwise, it’s back to the host, who I must agree has left a wonderful legacy of information and advice for us to relfect on. Thank you so much for your comment. It brought tears to my eyes to know someone took the time to read my post. Thank you so much for your words and for letting me know i’m not alone. I would be very appreciative if you have any tips that can help me work through this. I’m glad to have helped, and I’d be happy to discuss this further. I’m always cautious about giving “advice” because I think everyone’s circumstances are different, and also because I’m simply not qualified to. But I CAN tell you what has or hasn’t worked for us – and maybe that will help. I’ll try to write something later this week. I also just want to clarify that the “2 autistic evaluations” did not lead to a diagnosis? If that correct? If not then what was the diagnosis? Sorry it’s been a while but today is one of those days when you wish you can just have someone listen to you and you can just let it out. The 3 evals he had done, 2 through UCLA and 1 from regional center shows nothing. They say he’s just fine but the school says otherwise they continue to harrass me when i drop and pick up my son everyday. Let me know if you have any advice. There’s few things worse than having to face the stares and stern looks of school staff so you have my full sympathy. OK – let’s get down to brass tacks. You say they harass you. But harass you about what exactly? What is it that your boy is doing that is worth harassment? You’ve mentioned in an earlier post that they say he’s “impulsive” and “high energy” but what does this actually mean? Lots of boys are impulsive. Lots of boys have high energy. In fact – MOST 4 yo boys are impulsive and have high energy. It’s all relative to their age and stage. If I leave a whole tub of ice cream out, I would expect that an adult would think “oh, gosh, that ice cream looks good, but I better not eat it all, because that would be bad for me, and others may want to share it” etc etc. That’s what we call managing impulsivity. However, I don’t expect that from a 4 year old. I expect them to just eat the whole lot unless someone physically stops them. So, look, it’s hard to know exactly how to respond to your preschool if I don’t know exactly what it is they are upset about but if they are still talking in terms of vague things like “he’s too impulsive” then I’d hit them with more questions and press them for their answers. Of course, if they can cite really SERIOUS issues then that’s a different matter. But if all they’ve got is “oh, he’s a bit hyper” or “of, he’s a bit rough” or “oh, he doesn’t join in with the other kids” or “he’s just not socialising like we would like” then I’d say this school needs to be put back in their place. The spectrum of “normal” within preschool children is huge and wide. Kids come into preschool with all kinds of temperaments, strengths, weaknesses, talents, fears etc. The goal of a good school is to work with each of these kids – not just the easy ones. That’s their freakin job! If your kid genuinely has an issue that places them beyond the boundaries of mainstream teaching then that’s one thing. But so far you have three assessments by professional peds which say that is NOT the case. In the mean time, just keep in mind that three teams of people with stacks of letters after their names have all met your little guy and said, “nothing to see here”. These are the people whose JOB it is to make these calls – not your preschool director. My 3 year old toddler just went for an evaluation with the speech therapist and was told that he had a delay of 1 year in his speech and a delay of 2 years in his understanding… How do I go about helping him… Though I don’t really believe in my toddler having an understanding of a 1year old… He definitely demonstrates a higher level of understanding, just that it was bit captured on the day of the test..
Having resd this I believed it was extremely informative. i have never submitted anything online , but your blog is amazing!!!! i am a mum of identical twin boys , 2 years n 3 months love them to moon and back ! ,i have 2 extreme boys with different behaviours , they look different i dont know how they told me they are identical !! Thank you so much for the lovely article “Cherish the fourth”…planning our fourth at the moment and it’s just lovely to read these encouraging words, I will refer back to them when I am challenged as I know I will be continually over the coming months by those who insist that I must be insane……..